In our digital world, it is important to be able to protect our own work as well as use others' copyrighted work without permission. Students are accessing large amounts of information, reworking it, and sharing it with others not only in the classroom but also around the world. Because it is getting easier to find, copy and distribute content, we need to make sure students understand how to use copyrighted materials in the correct way. A copyright is a law that protects the creator's ownership of and control over the work he/she creates. 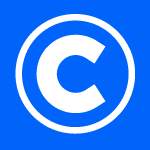 A creative commons license allows work to be used for free as long as you give credit to the creator. Copying and presenting another person's work as your own is illegal and considered plagiarism. Failing to put a direct quote in "quotation marks"